The cast from Attic Door Productions pose outside Lancaster Castle ahead of their show, The Two Gentleman of Verona. Picture reveals Shakespeare’s return to Lancaster Castle this month. Some of the cast at Attic Door Productions pose outside the castle before they present The Two Gentlemen of Verona next week. 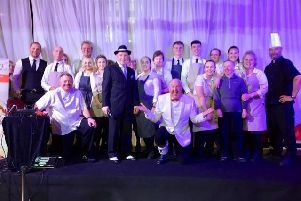 “When we discovered that Demi Paradise would be retiring we approached the castle and offered our services,” said Ben Muir, company director at Attic Door Productions based in Morecambe. The Two Gentlemen of Verona is believed to have been Shakespeare’s first play, and Mr Muir thinks it is fitting to make it their first performance at the castle. As well as Shakespeare performances, Attic Door will also be staging a return with their family promenade show, The Jungle Book; then in October they will be presenting ‘The Trial of Van Helsing’. There will also be a secret-agent themed murder mystery in May. The Two Gentlemen of Verona runs from Tuesday April 18 to Saturday April 29 (no shows on Sunday and Matinees on Saturdays), tickets from £12.50 to £22.50 on 01524 64998.